As if you ever needed an excuse to go to Maine, the Frozen Rush Pro4 truck race going down at Sunday River on the 10th promises to be pretty awesome. Last February Ricky Johnson had this Pro4 Ram romping around Mount Snow in Vermont with studded tires and space heaters aimed at the shocks, blasting around slalom gates and throwing rooster tails that put Shaun White to shame. 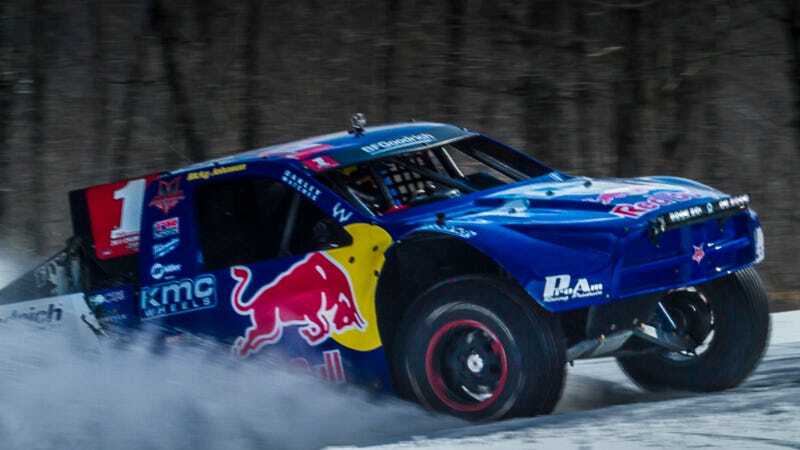 This year Red Bull is at bringing it back, with eight Pro4 vehicles competing at Sunday River's "South Ridge." Two trucks will be on the course at a time in a bracketed, single elimination race format. Sanctioning the race is The United States Auto Club, who have undertaken the responsibility of ensuring everyone's safety and satisfaction. Red Bull's event page puts the distance from Boston to Sunday River at "a few hours" but make no mistake, it's bloody far from anywhere and don't expect Jackson Hole ski-town night life when you get there. That said, Sunday River is a fun place to ski and ride. The event is free to spectate, and I'm sure you can count on free cans of Red Bull being flung around like Mardi Gras beads. Better watch your head. We should have some images and a rundown of the Frozen Rush after it goes down, stay tuned!